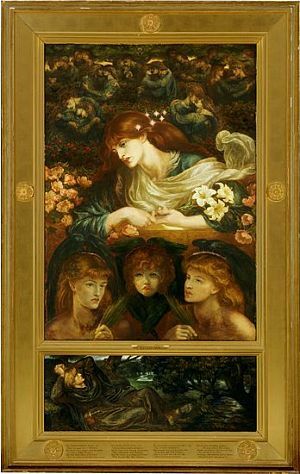 The poem and the painting I am going to compare are both self-titled “The Blessed Damozel” by Dante Gabriel Rossetti. The poem was published on February, 1850, and the painting was produced between 1875-8. So, in this case, the painting can be considered as the representation of the poem itself. This is one of the saddest poems I have ever read. The author writes about the story of “The Blessed Damozel”, a lady who is settled in a sort of heaven crying and lamenting because her lover is still on Earth and she prays God with the purpose to make her lover die thus to be able to be together in that kind of heavenly paradise. The poem is divided in 24 iambic stanzas (6 verses each one). The stanzas are divided in short verses (2-4-6 of each stanza) and quite long verses (1-3-5. Furthermore, the rhyme is: “abcbdb”, so, although, at first sight, the rhyme and form seem arbitrary, if we observe in detail, we appreciate that the author uses a highly regular rhyme form. This poem is full of images, most of them are used to express the melancholy and sadness of the lady. For example: the fact that she is leaned over the heavenly balcony witnessing all the souls coming up to heaven, except his lover’s one; her eyes full of tears; the constant repetition of the time she has been waiting (ten years)… give us the impression of the complete desperation that the lady is suffering. However, for me, the most beautiful and representing image of her grief in the poem and also in the painting is the visual metaphor that she is surrounded by “happy newly met lovers” who can enjoy their endless love as “their souls mount up to God” (Stanza 7). Besides, the author also focuses on the enclosing elements that surround the lady: the presence of the moon and the stars, which are used to emphasize the lady’s mood, are useful to create the contrast between the darkness in which she is living and the light and joy in the rest of the universe (L. 55). So we appreciate a lady that is not only anguished because of her lover’s absence, but because the fact that everyone is happy except her. Furthermore, another important aspect is the fact that the author uses religious imagery to describe the whole situation. We can read several references to Mary, God, the angels, the Holy Spirit… which are very important to understand the real symbolization of “The Blessed Damozel” and the meaning of the poem. Concerning the religious symbolism, I think that the Blessed Damozel could be interpreted in several ways. The first one is a similitude between the lady and the Virgin Mary. Both are merely compared several times along the poem (L. 9, 104…) But, some-how, in my opinion, the figure and position of the lady reminds me of the figure of a martyr, or of Jesus Christ on the Cross, praying God for the end of his pain. The painting is a faithful reproduction of the poem itself. It only captures one moment of the poem’s narration, but I think, this capture represents the whole symbolic meaning of the poem. There are several elements that appear in both of them (the lady, the lovers behind, the three angels, the balcony, the seven stars in her hair (the seventh one is hidden behind her head because of the visual perspective) and the three lilies in her hand). However the painting can also have some interpretations that are slightly different from the poem. The first feature I have noticed is the use of colours. We can appreciate that the green colour is patently present on any element of the picture. I think that the author uses this colour as a symbol of life and Nature. Truly, everything seems lively surrounding the lady, which contrasts with her real mood. Nevertheless the use of light is contradictory. From a symbolic point of view, the girl should be painted in darkness (if we consider dark colours as a symbol of sadness, sorrow…) distinguishing her from the elements that surround her that should be painted with luminous colours. However, she is illuminated with the major ray of light and the rest of the painting is tinted with dark tonalities of green or other colours. In my opinion, the author allows himself this “contradiction” to make the viewers really concentrate on the most im-portant figure of the poem and the painting, which is the lady herself. The presence of the lover is also important (the man in the part below of the painting) and specially his attitude. Despite the fact that he has the hands crossed as a symbol that he is praying, his face does not reflect excessive pain and his expression seems relaxed. From my point of view, this aspect differentiates with the most important feature in the painting, which is the expression of pain on the face of the girl, where, specially her eyes show all the pain she is suffering. In conclusion, the poem and the painting are two splendid and beautiful representations of the Blessed Damozel, who is condemned to a never ending suffering because she can not enjoy her love as the rest of people do. A poem that has set down over me a total feeling of despair, because I do not find any positive element along the poem.